Dolberthog Farm01597 822255work FarmhouseA warm, friendly welcome awaits you at Dolberthog Farm. Situated in quiet countryside one mile south of Llandrindod Wells. Enjoy a relaxing holiday with a breath of fresh air, scenic walks, river fishing and birdwatching. It is an ideal spot from which to tour mid-Wales, being within easy reach of the Elan Valley Reservoirs, Powis Castle, Brecon Beacons and many more places of interest. Our rooms have en-suite or private bathroom, beverage tray and television. Family, twin or doubles are available. We are situated south of Llandrindod Wells, a Victorian Spa Town, amenities include golf, outdoor and indoor bowling, fishing and pony trekking. A warm, friendly welcome awaits you at Dolberthog Farm. 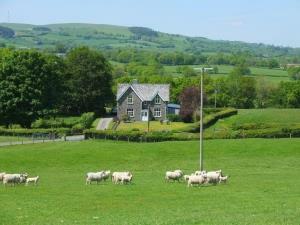 Situated in quiet countryside one mile south of Llandrindod Wells. From Llandrindod Wells take A483 South as leaving town. Pass Texaco garage on left, continue 200 yds. Take first right over railway bridge. Continue down lane 0.5 mile, Dolberthog on right.